Amazon Web Services will store the new mountains of game data, including player tracking via RFID, some of which will be available to NFL fans through Next Gen Stats. When the NFL season kicks off next month, fans will have new information at their disposal thanks to the league’s Next Gen Stats program, which will provide previously undisclosed data to fans, like players’ speed and acceleration. Next Gen Stats are a key part of the company’s new NFL apps for Windows 10 and Xbox One, which are slated for release in the coming weeks. The smaller white box in the center of the frame houses one of Zebra’s RFID readers, used for tracking players’ positions on the field. The information is provided by a system Zebra Technologies has installed inside every professional American football stadium that tracks players through RFID tags installed into the shoulders of their protective pads. Those tags tell sensors placed around the stadium where players are 25 times a second—and the positions they record are accurate to under 6 inches. That constant stream of data is then processed by Zebra’s MotionWorks server software before getting handed off to the broadcasters covering the game so they can take the information and overlay it on instant replays. It’s also uploaded (along with additional information about the game state like the time on the clock) to the NFL’s AWS setup for storage and sharing with the league’s partners, including Microsoft. 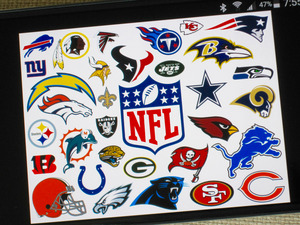 The RFID tag Zebra is using to power the NFL’s Next Gen Stats. For right now, Swensson said that it’s going to take it slow when it comes to releasing the Next Gen Stats data more broadly. He said that it’s easy to “quickly go down a rabbit hole” when it comes to slicing the data different ways, and the league is taking a slower approach to working with it. It’s easy to see why: Looking at data Zebra gathered from the Super Bowl, it was easy to pick out some players’ tendencies in a way that could give teams an advantage against their opponents. Opening that up willy-nilly could have serious consequences for the state of American football. The stats aren’t all fun and games, though: Swensson said that the data would also be made available to the teams at the NFL working on health and safety initiatives. He couldn’t give specifics about what those initiatives are or how they could be helped by the statistics, but having data about a player’s actions on the field should at least provide another data point to understanding what happens with them. Now that it has solidified its implementation with the NFL, Zebra is eyeing other sports for potential expansion. Jill Stelfox, the vice president and general manager of Zebra’s Location Solutions division, said the company is looking into supplying the same solution for college football teams to provide continuity in statistics for students who go pro, along with valuable information for professional scouts. As for Swensson, he sees loads of potential for integrating high tech tools with football. One of the things he’s intrigued by is the idea of using augmented reality through hardware like Microsoft’s HoloLens to provide fans in the stadium with more information about the game that’s going on in front of them.